Lori Rice is a fourth-grade teacher at West Elementary in Wamego, Kansas, who has taught K-2 reading as well as kindergarten, first grade and fourth grade since 1996. She has a passion for creativity, learning, questioning and the whole child. Her classroom is a place of acceptance and celebrating differences. Goal: noun; the object of a person’s ambition or effort. Aim: verb; having the intention of achieving. If we don’t aim for goals, we may end up where we don’t want to be. But setting those goals in the first place can be challenging. 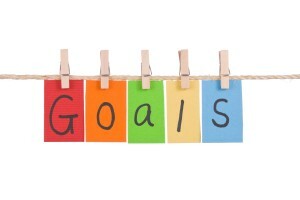 Goal setting provides for success for both students and teachers. Often, in August, teachers set goals for themselves and their classrooms. If you did not start your year with goals, check out my article “Start your School Year Strong: Set Goals.” If you did set goals, the end of the first nine weeks is a great time to reflect and plan alternative strategies to overcome obstacles or difficulties you have encountered in the school year. Last year, our school implemented Habits of Mind. The sixteen habits are lifelong traits, and they folded into my personal teaching philosophy effortlessly. I had already been using these habits with my students, but now had words and a more meaningful way to teach these important life skills. Goal setting is a classroom practice that ties neatly with the habit of persistence. Goal setting is an important process in learning persistence. What have you accomplished this quarter? Are you moving towards your classroom goals? What is preventing you from reaching those goals? What do you need to continue towards those goals? As educators we have goals in place, but do you stop and teach your students to set goals? Setting goals should be taught and modeled. This year my fourth graders are working on goals. They have each decided on something they are working to accomplish by December. These are goals that will stretch them a bit. They have imagined and drawn themselves achieving the goal. You must be able to visualize yourself attaining it to move towards it. If you need suggestions for setting teaching goals, check out this resource on Habits of Mind . Persistence and self-reflection are part of the goal setting process. Each week we set smaller goals that move us towards the larger goal. Students are working on behavior goals from focusing during discussion to attending to task as well as academic goals of multiplication and spelling. They set their own goals and pace themselves. They self-reflect to see what is working and what they need to adjust. We talk about what help they need set in place. This process has helped them remain focused on the larger goal and see the steps that move them closer to achieving it. Persistence is a habit of mind that can be taught with goal setting. Here are some things I do in the classroom during large group reading and writing instruction as well as during guided reading center time. These activities allow students to explore and learn about the trait of persistence. Define the word persistence. Draw a picture and write a definition in your own words. Describe how you can show persistence. Define the word excellence. Draw a picture and write a definition in your own words. Describe how you can do things with excellence. Create a chart about persistence. Include what it looks like, what it feels like and what it sounds like. Create a chart about excellence. Include what it looks like, what it feels like and what it sounds like. Activities: Select Activities from the list to complete on notebook paper, computer paper, or on a technology device (tablet, iPad, computer). Give examples of a character in a literature book demonstrating persistence. Reference the page numbers that support this idea. Give examples of a character in your book demonstrating excellence. Reference the page numbers that support this idea. Read a book or article about “Thomas Edison”. Answer these questions. What was Thomas Edison’s experience like in school? Did he complete school? How do you know? How did he develop his inventions? What makes him an example of persistence? Research information about Thomas Edison. List his inventions and patents. Rank them in order of importance. Explain why you selected the most important and least important item. Create a list of animals you think are persistent. Draw one of these animals. Label the characteristics it has that make it persistent. Write about an experience in gym class where you had to use persistence. Design a poster to explain and illustrate this habit of mind—persistence. Create a list of books that have characters that are persistent. Draw a picture of a mountain. Inside the mountain, write about something that was hard for you, but you had persistence and completed. Draw yourself climbing the mountain. Goal setting should be part of your classroom routine. Students must be taught to set goals. Review the goals with students and ask them how their persistence is moving them towards the goals. Set an example and share your goals with the students. Tell them when you had a week that was hard. Celebrate when you reach your goals. Take the time to reflect and see the growth. Share your intention of achieving the object of your intention. Set goals!